Starbucks: you make me feel good! 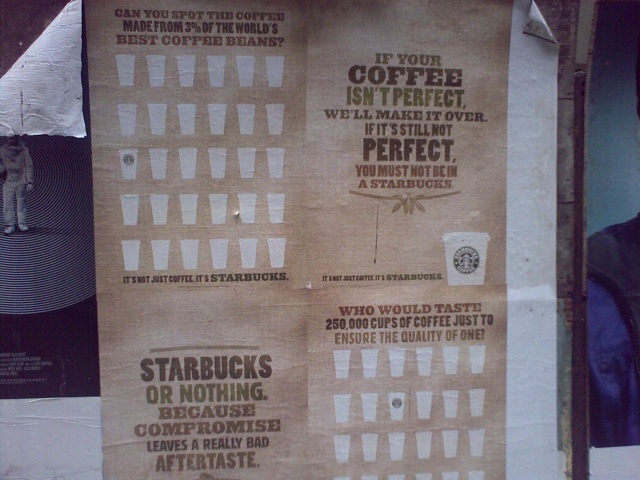 Over the last months Starbucks has done a fantastic job in injecting their core brand promise to the public. 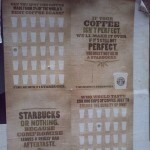 Ranging from NY times full page advertisement to outdoor posters the message was the same: it’s not just coffee… it’s Starbucks. All backed up with quality & fair trade messages. I really liked this campaign and it did give me the ‘feel good’ feeling when sipping some vanilla latte at the local Starbucks. I mean: who would not be happy to know that the coffee beans used in Starbucks coffee come from well selected farmers and contains 3% of the world’s best beans? That must mean there is a lot of crap coffee out there! Even though I am sure nobody ever really bothers about that when drinking coffee in a restaurant or even at home: ever seen a pack of coffee in the local super market that contained the worlds 1% best coffee beans? So, why does it work here so well? 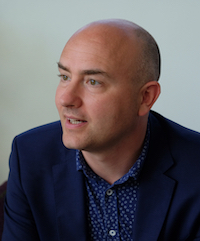 My take on it is simple: quality and fair trade is a great differentiator in the ‘fast food / fast delivery’ segment Starbucks operates in … nobody else can claim it. The Starbucks message works very nicely against local deli’s/ supermarkets, Dunkin Donut, McDonalds etc. 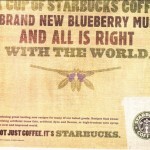 I am a believer: in this segment there is only place to get a cup of coffee as good as Starbucks… it’s Starbucks! Update july 12: this morning an other advertisement in the New York times. 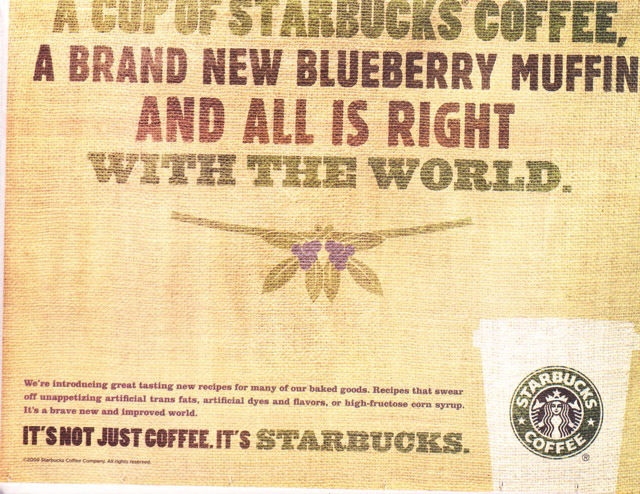 Enticing title “A cup of Starbucks coffee, a brand new blueberry muffin and all is right with the world”. How cool is that!? Especially when you read that the new recipes “swear off unappetizing artificial trans fats, artificial dyes and flavors, or high-fructose corn syrop”. Now that is even cooler! I feel now even better taking a high calorie muffin with my coffee:-) Point is of course: Starbucks is hitting home run with their brand promise and differentiating at the same time and is doing it in my opinion very well. Tropicana: ‘back to the future’ transition completed. Simple lesson: test! 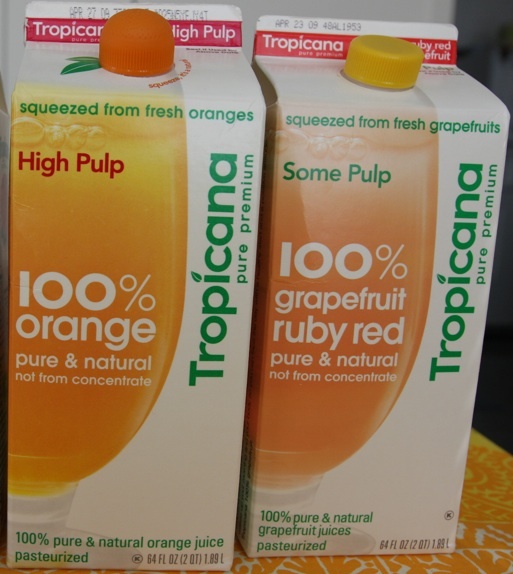 I remember the day when my wife came home from shopping in the local supermarket complaining that she had a hard time finding our favorite Tropicana juice. “They have changed the packaging and I cannot find anything anymore! Almost took the wrong one!”. She was not complaining for a wrong reason. 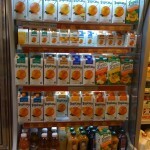 Take a look at the two Tropicana juices on the left. Yes: they are actually different but it is really difficult to spot: ‘high pulp’ and ‘some pulp’ in a different color, different caps and some other small differences. Surely this might work when you have just two packs next to each other but it gets totally different when you see a whole shelf full of similar looking packs! Other consumers realized this too and after less than 2 months and a 20% drop in sales the new pack was replaced by the old one! Today I noticed that in the supermarket all the ‘new’ packs are finally gone and replaced with the good looking, differentiating ‘old’ packs with the new redesigned cap. Below you see an image of the ‘new’ pack in supermarket context and the ‘old’ pack. Surely the old pack helps consumers to navigate much much better! This is a great objective but hard to imagine that the execution should result in very blend and non differentiating design within the Tropicana range! 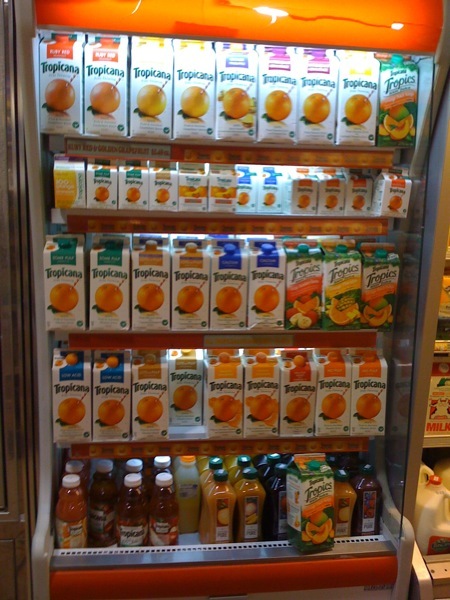 It was so blend that even consumers were not able to navigate in the store to find their favorite juice! 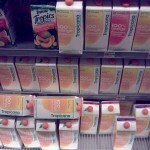 In fact: over the last 3 months I have had at least 2 times that I took accidently the wrong juice home! Something that never happened with the ‘old’ sales pack! Why? The various colors that would help me to navigate (orange=no pulp, green=some pulp) were difficult to find as the overall pack looked so much the same. Then on the objective to remind consumers that Tropicana is pure, natural and squeezed from fresh oranges. Why change from the fresh oranges with the straw to difficult to see orange juice in a glass? 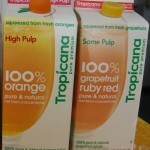 Is it not better for consumers to know that the oranges used to create Tropicana were the best on the planet? Showing them on the sales pack with a straw (so fresh you can drink from them!) did a perfect job! 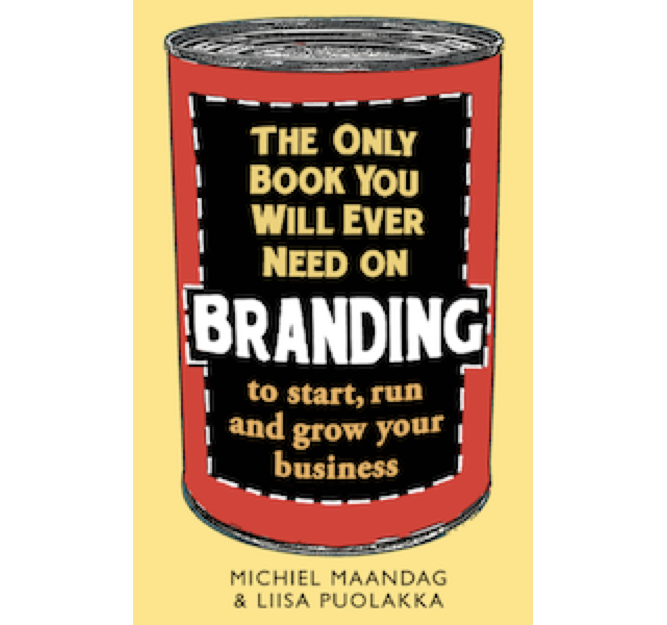 Identity which elements in your visual identity drive consumers to purchase your product. In case of Tropicana it could have been the image of the fresh looking orange and the straw that strengthens the feeling of freshness even more. Identity which elements in your visual identity help consumers to navigate in your portfolio. 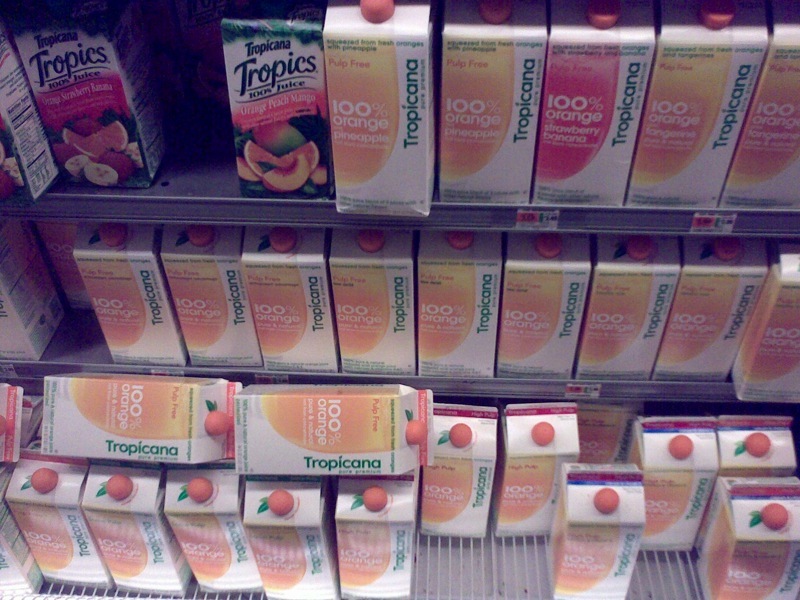 In case of Tropicana it is for sure the use of colors for the different variants of juice. Identity which visual elements consumers feel belong to your brand. In this case: the happy font, the straw, the fresh orange. Any changes you make to #1-#3 you test in a retail environment with consumers who are in hurry to grab their favorite product and do not have time to admire individual design details.